Lots of changes have taken place since I completed this painting back in 1984. 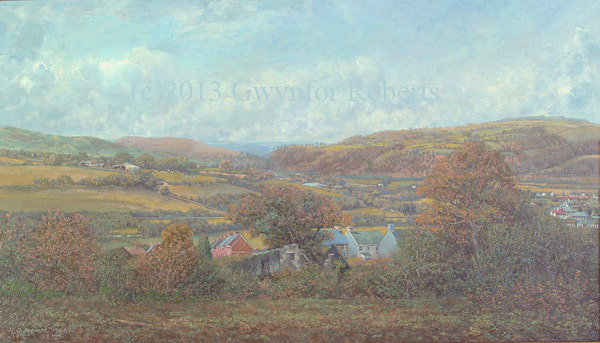 Self build houses replace the remains of the farm fouse in the forground, the Caerphilly bypass has been introduced, Forge mill housing estate now fills the fields on the distant right hand side of the painting, and a new general hospital stands in the former Ystrad Fawr estate- this is where the old NCB offices, the original buildings of Colonel Lindsay (?) (marriage registry offices) and Penallta rugby club and ground was situated. Lets not forget the small field on the lower left which is now a Tesco car park.